At the right time of year, as winter deepens, the producers gather in the early hours of the morning when temperatures are barely above freezing, to pick the Jacquère grape while it is still frozen on the vine. The grapes remain frozen as they are pressed, and will stay in temperatures of under 3°C for the next 48 hours. Next, the frozen grapes and juice are suspended from a helicopter, and flown up to the mountainous altitudes around Mont Blanc. There, they will freeze for a second time. This intensive process results in a highly-concentrated, sweet and high-sugar wine. This is because, at freezing temperatures, the water in the grapes freezes, but the sugars and other solids do not, allowing the juice to become sweeter and more concentrated. It is only after this two-stage freezing process that the wine is allowed to ferment normally. Over 8,000 bottles of Savoie ice wine are sold every year, and are mainly available at high-end restaurants in France and Europe, as well as China and the United States. 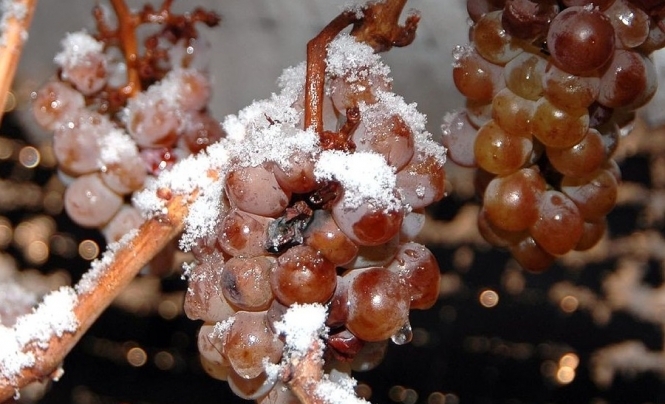 Ice wine is produced across Europe - where temperatures allow - but especially in Germany, where it is called “eiswein”. It is also produced in Canada, Japan, and the United States.